Balmoral Outlines New Gold and Nick… | Balmoral Resources Ltd.
(Vancouver, May 24, 2018) Balmoral Resources Ltd. (“Balmoral” or the “Company”) (TSX: BAR; OTCQX: BALMF) today provided details on several new gold targets and highlighted the discovery of a new ultramafic intrusion with nickel-copper-cobalt-PGE potential on its Martiniere Property which forms part of the Detour Gold Trend Project in Quebec. 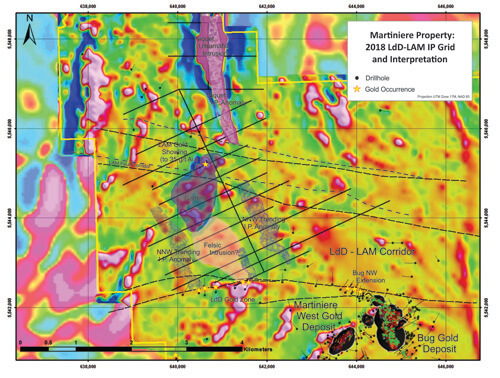 Recently completed drilling and geophysical programs continue to emphasize the gold discovery potential within the Martiniere gold system, including the potential for the discovery of the offset northern segment of the Bug gold deposit. The Bug gold deposit is currently terminated at its northern end by the Lac du Doigt fault zone. 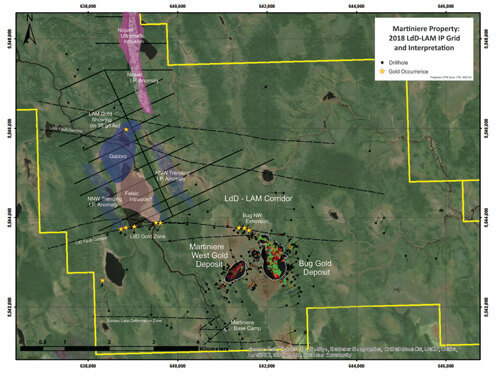 Drilling by the Company in conjunction with the recently completed winter geophysical program in the largely untested LdD/LAM corridor, north of the deposit (see Figure 1), has confirmed the presence of certain geological markers and several NNW trending (Bug gold deposit-parallel) I.P. 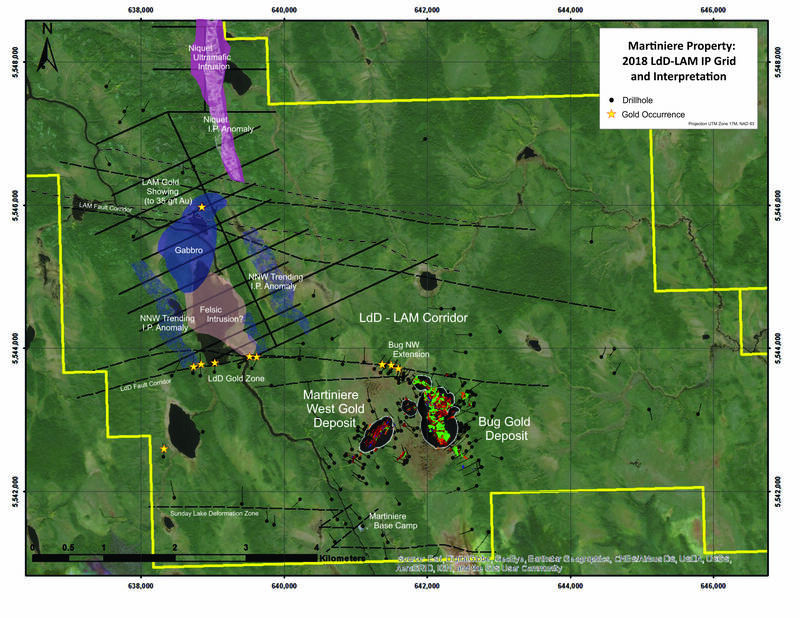 anomalies located approximately 2.0 kilometres west of the northern termination of the Bug gold deposit. These anomalies have not been drill tested, but given their orientation and setting could represent the offset continuation of the Bug gold deposit or similar gold mineralized structural zones. Gold mineralization is known in the bounding structures to the north and south (see Figure 1 and Figure 2) of these newly outlined anomalies. These new targets are high priorities for testing, and ground work in preparation for drilling is anticipated to begin in June. In addition, the winter geophysical program has mapped an extensive anomaly within the recently identified Niquet ultramafic intrusion (top of Figure 1 and Figure 2) on the northern portion of the Martiniere Property. A very limited surface mapping program in the fall of 2017 confirmed the presence of ultramafic rocks in association with a 2,500 metre long N-S trending magnetic high. Widely spaced I.P. lines across this newly identified ultramafic intrusion have outlined a series of chargeability anomalies which span much of the length of the complex which are similar to the geophysical footprint of the Company’s Grasset nickel-copper-cobalt-PGE deposit located 40 kilometres to the east.Neither the anomalies nor the Niquet intrusion have ever been tested by drilling. Follow up work in preparation for potential drill testing will be included in the summer program at Martiniere. As at Grasset the Company controls the entirety of the newly identified intrusion. Mr. Darin Wagner (P.Geo.- B.C., Ont., Res. Permit Que. ), President and CEO of the Company, is the non-independent qualified person for the technical disclosure contained in this news release. Mr. Wagner has supervised the work programs on the Martiniere property since inception, visited the property on multiple occasions, and has discussed and reviewed the data contained in today’s release. This press release contains forward-looking statements and forward-looking information (collectively, “forward looking statements”) within the meaning of applicable Canadian and United States securities laws. All statements, other than statements of historical fact, included herein, including statements regarding the anticipated content, commencement, duration and cost of exploration programs, anticipated exploration program results, the discovery and delineation of mineral deposits/resources/reserves, the timing of the receipt of assay results, the visual continuity of certain mineralized intervals, the potentially open nature of the mineralized zones on the properties, prospects and the potential for future discoveries of additional mineralization on the property, business and financing plans, timing, cost and objectives of planned exploration programs and economic trends are forward-looking statements.Forward-looking statements are typically identified by words such as: believe, expect, anticipate, intend, estimate, postulate and similar expressions or are those which, by their nature, refer to future events. Although the Company believes that such statements are reasonable, there can be no assurance that such statements will prove to be accurate, and actual results and future events could differ materially from those anticipated in such statements. The Company cautions investors that any forward-looking statements by the Company are not guarantees of future performance, and that actual results may differ materially from those in forward-looking statements. Important factors that could cause actual events and results to differ materially from the Company’s expectations include those related to weather, equipment and staff availability; performance of third parties; timing of receipt of assay results from third party analytical facilities; risks related to the exploration stage of the Company’s projects; market fluctuations in prices for securities of exploration stage companies and in commodity prices; and uncertainties about the availability of additional financing; risks related to the Company’s ability to identify one or more economic deposits on the properties, and variations in the nature, quality and quantity of any mineral deposits that may be located on the properties; risks related to the Company’s ability to obtain any necessary permits, consents or authorizations required for its activities on the properties; and risks related to the Company’s ability to produce minerals from the properties successfully or profitably. Trading in the securities of the Company should be considered highly speculative. All of the Company’s public disclosure filings may be accessed via www.sedar.com and readers are urged to review these materials, including the latest technical reports filed with respect to the Company’s mineral properties.